Issues such as disposable income or net worth (taxes not withstanding) were not terms that “The 400” of the gilded age would have known, much less worried about. The wealth of the families that lived in the late 19th and early 20th centuries often came from the industrial revolution of the time, and these families knew how to spend! 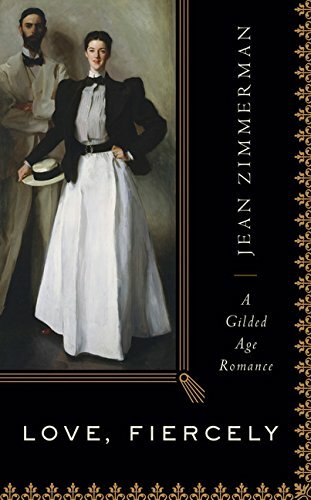 Author Jean Zimmerman’s book, Love, Fiercely: A Gilded Age Romance, the story of I. N. (Newton) Phelps Stokes and Edith Minturn Stokes, presents the story of this couple as a love story that is hard to put down, in large part because the marriage of two wealthy families at this time in history shows how wealth can, indeed, make two people happy. The historical content of the lives of each of these people is well detailed. Edith Minturn is drawn as a woman who is independent in a time when the independent woman was still a dream. One of four daughters and two sons (a third died son, Francis, had died in childhood), Edith’s beauty was renowned throughout her circle of close friends and distant acquaintances; yet in a time when young women were expected to marry in their early twenties and begin the regimen of raising the next generation of wealthy leaders, this state seemed to escape her. Her family’s fortunes rose and fell with the economic tides of the day, but never to the point of being penniless. Edith’s independence raised itself up through a pastime of the era called “tableau vivant” when partygoers, dressed in extravagant costumes, would strike frozen poses that would represent literary or biblical themes. Ms. Zimmerman points out that through this activity, Edith came to the attention of the artist, Daniel Chester French. Through their acquaintance, Edith came to pose for one of French’s most spectacular works of art—the statue The Republic, commissioned as the centerpiece of the Columbian Exhibit at the 1893 Chicago World’s Fair. Upon completion, the statue stood over 65 feet tall and Edith Minturn achieved immediate recognition. Her beauty propelled her into other artists’ studios as luminaries such as John Singer Sargent and Cecilia Beaux strove to capture her beauty on canvas. Isaac Newton Phelps Stokes came into the world with a pedigree that swelled on both sides. His life was riddled with health problems, and yet he lived for 77 years. A successful architect, he was responsible for designing many buildings that survive to this day. Many of his projects included constructing his own residences; one a reconstruction of an historic home in England slated for destruction and saved by Newton. He bought this structure and had it taken apart and transported across the Atlantic to his property in Connecticut, where it was reconstructed. Upon its completion, he enjoyed commenting that he owned the oldest house in America. Isaac Newton Phelps Stokes seemed to ramble easily though the life of a wealthy scion, collecting things that amused him, until his Iconography project took over his life. Throughout their marriage, Edith never took a backseat to her husband as so many women in America did during this era. She remained active as a leader in many associations and she took great care in raising their adopted daughter, Helen. That Edith and Newton—so different in personality—should ever come together seems impossible to contemplate, and yet they were drawn to each other, their fate resulting in the successful unification of two wealthy families—a union linked through love. Ms. Zimmerman infuses life into these characters through her detailed research. Each blossoms into a three-dimensional human being via the author’s physical descriptions as well as conveyed through their thoughts and dreams as extracted from their personal diaries and personal and public letters.